"Strategic Command" redirects here. For other uses, see Strategic Command (disambiguation). Strategic Command was established in 1992 as a successor to Strategic Air Command (SAC). It is headquartered at Offutt Air Force Base south of Omaha, Nebraska. In October 2002, it merged with the United States Space Command (USSPACECOM). It employs more than 2,700 people, representing all four services, including DoD civilians and contractors. Strategic Command is one of the three Unified Combatant Commands organized along a functional basis. The other six are organized on a geographical basis. The unified military combat command structure is intended to give the President and the Secretary of Defense a unified resource for greater understanding of specific threats around the world and the means to respond to those threats as quickly as possible. On 1 June 1992, President George H. W. Bush established the U.S. Strategic Command from the Strategic Air Command (SAC) and other Cold War military bodies, now obsolete due to the change in world politics. The Command unified planning, targeting and wartime employment of strategic forces under one commander. Day-to-day training, equipment and maintenance responsibilities for its forces remained with the Air Force and Navy. As a result of the 2002 Nuclear Posture Review, the Cold War system of relying solely on offensive nuclear response was modified. Shortly after a meeting between President George W. Bush and Russian President Vladimir Putin in Moscow in May 2002, a summit was held during which both leaders signed a treaty promising bilateral reductions that would result in a total of 1,700 to 2,200 operationally deployed strategic nuclear weapons for each country by the year 2012. 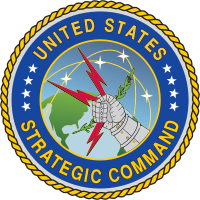 The activation of the new USSTRATCOM took place on 1 October 2002. The merged command was responsible for both early warning of and defense against missile attack as well as long-range strategic attacks. President George W. Bush signed Change Two to the Unified Command Plan on 10 January 2003, and tasked USSTRATCOM with four previously unassigned responsibilities: global strike, missile defense integration, Department of Defense Information Operations, and C4ISR (command and control, communications, computers, intelligence, surveillance and reconnaissance). This combination of roles, capabilities and authorities under a single unified command was unique in the history of unified commands. Some officials believed this would allow each to focus more effectively on its primary mission and allow the mission of space to have focused attention and be better integrated with other military capabilities. This comes after some concern by officials and lawmakers such as U.S. Senator Wayne Allard (R-Colo.), an advocate for national security space activities, complained in a March 2006 memo to Defense Secretary Donald Rumsfeld about what he saw as a declining emphasis on space within the U.S. Department of Defense and specifically the way space has been organized at U.S. Strategic Command. As result of the separation, The Missile Correlation Center in Cheyenne Mountain AFS was broken into two separate entities. NORAD/NORTHCOM (N2C2) now controls the Missile and Space Domain (MSD) and JFCC Space controls the Missile Warning Center (MWC). They are both still located at Cheyenne Mountain AFS. It was expected that MSD would eventually move to Peterson AFB to join the rest of N2C2. The missions of U.S. Strategic Command are to deter attacks on U.S. vital interests, to ensure U.S. freedom of action in space and cyberspace, to deliver integrated kinetic and non-kinetic effects to include nuclear and information operations in support of U.S. Joint Force Commander operations, to synchronize global missile defense plans and operations, to synchronize regional combating of weapons of mass destruction plans, to provide integrated surveillance and reconnaissance allocation recommendations to the SECDEF, and to advocate for capabilities as assigned. Marine Corps Forces Strategic Command Helps to coordinate USMC and StratCom in areas such as "space, cyberspace, electronic warfare, and combating weapons of mass destruction". USSTRATCOM exercises command authority over four joint functional component commands, also known as JFCCs as well as Joint Task Forces and Service Components. This combination of authorities, oversight, leadership and management is supposed to enable a more responsive, flattened organizational construct according to the commands leadership. Joint Functional Component Commands These commands are responsible for the day-to-day planning and execution of primary mission areas: space and global strike; intelligence, surveillance and reconnaissance; network warfare; integrated missile defense; and the recently added mission of combating weapons of mass destruction. Joint Functional Component Command for Global Strike (JFCC-GS) The Commander Eighth Air Force (AFSTRAT-GS) serves as the Joint Functional Component Commander for Global Strike. JFCC-GS conducts planning, integration, execution and force management of assigned missions of deterring attacks against the U.S., its territories, possessions and bases, and should deterrence fail, by employing appropriate forces. Some of these tasks belonged to a JFCC for Space and Global Strike before being split into two components. Joint Functional Component Command for Space (JFCC Space) The Commander 14th Air Force (AFSTRAT-SP) serves as the commander for JFCC Space. This component conducts planning, execution, and force management, as directed by the commander of USSTRATCOM, of the assigned missions of coordinating, planning, and conducting space operations. Joint Functional Component Command for Integrated Missile Defense (JFCC IMD)—The Commander, U.S. Army Space and Missile Defense Command/Army Forces Strategic Command, also serves as the commander for the JFCC IMD. This component is responsible for meeting USSTRATCOM's Unified Command Plan responsibilities for planning, integrating, and coordinating global missile defense operations and support. JFCC IMD conducts the day-to-day operations of assigned forces and coordinates activities with associated combatant commands, other USSTRATCOM Joint Functional Components and the efforts of the Missile Defense Agency. Joint Functional Component Command for Intelligence, Surveillance and Reconnaissance (JFCC-ISR)—The Commander, JFCC-ISR, also serves as the Director, Defense Intelligence Agency. This component is responsible for coordinating global intelligence collection to address DoD worldwide operations and national intelligence requirements. It will serve as the center for planning, execution and assessment of the military's global Intelligence, Surveillance, and Reconnaissance operations; a key enabler to achieving global situational awareness. Center for Combating Weapons of Mass Destruction (SCC WMD)—The Secretary of Defense recently assigned USSTRATCOM responsibility for integrating and synchronizing DoD's efforts for combating weapons of mass destruction. SCC WMD works closely with the Defense Threat Reduction Agency (DTRA) and declared Initial Operating Capability on 26 January 2006 in a ceremony in Washington, D.C.
United States Cyber Command (USCYBERCOM)—The CYBERCOM is a subordinate unified command under United States Strategic Command created by United States Defense Secretary Robert Gates on 23 June 2009, and activated in September of that year. The command is led by the director of the National Security Agency, General Keith B. Alexander. It combined JTF-GNO and JFCC-NW, which were dissolved in October 2010. Aerial Refueling/Tankers—Task Force 294—Air Force refueling aircraft greatly enhance the command's capability to conduct global combat and reconnaissance operations. Tankers are assigned to Eighteenth Air Force, Scott AFB, Illinois, with headquarters at Air Mobility Command, Scott AFB, Illinois. Airborne Communications—The Navy's E-6B Mercury aircraft provide a survivable communications link between national decision-makers and the nation's strategic forces. An airborne command post, the E-6B enables the President and the Secretary of Defense to directly contact crews on the nation's ballistic missile submarines, land-based intercontinental ballistic missiles and long-range bombers. The E-6B aircraft are assigned to Strategic Communications Wing One at Tinker AFB, Oklahoma. Pacific Ballistic Missile Submarines, Task Force 134. Submarines based at Bangor, Washington, with the headquarters of Commander Submarine Forces U.S. Pacific Fleet being located at Naval Station Pearl Harbor, Hawaii. Joint Task Force-Global Network Operations (JTF-GNO)—Located in Arlington, Va., the Joint Task Force-Global Network Operations (JTF-GNO) is U.S. Strategic Command's operational component engaged in operation and limited defense of the DoD's Global Information Grid— supporting JFCC-NW in fighting Cyber-terrorism directed against the US military. This is done by integrating GNO capabilities into the operations of all DoD computers, networks, and systems used by DoD combatant commands, services and agencies. The Director, Defense Information Systems Agency also heads the Joint Task Force for Global Network Operations. This organization is responsible for operating and defending U.S. worldwide information networks, a function closely aligned with the efforts of the Joint Functional Component Command for Network Warfare, commanded by Director, National Security Agency. Strategic Bomber and Reconnaissance Aircraft—Aircraft assigned to Eighth Air Force, Barksdale AFB, Louisiana, are capable of deploying air power to any area of the world. B-1B Lancer heavy bombers are available at Dyess AFB, Texas and Ellsworth AFB, South Dakota, though the United States does not carry nuclear weapons in the B-1B in compliance with international treaty. B-52 Stratofortress heavy bombers are based at Barksdale AFB, Louisiana, and Minot AFB, North Dakota. B-2 Spirit stealth bombers are stationed at Whiteman AFB, Missouri. Worldwide reconnaissance aircraft assigned to Eighth Air Force that support the USSTRATCOM mission include the RC-135 Rivet Joint, Offutt AFB, Nebraska, and the U-2S Dragon Lady, Beale AFB, California. Land-based Intercontinental Ballistic Missiles—Air Force ICBMs dispersed in hardened silos across the nation's central tier, provide a quick-reacting and highly reliable component to the nation's strategic forces. Minuteman III missile launch control centers are based from F.E. Warren AFB, Wyoming; Malmstrom AFB, Montana; and Minot AFB, North Dakota, Peacekeeper missiles were based at F.E. Warren AFB. ICBM crews report to Twentieth Air Force, F.E. Warren AFB which is also dual hatted as Task Force 214, which reports to U.S. Strategic Command. The Peacekeeper missiles were officially deactivated on 19 September 2005. Targeting and strategic communications are provided by the 625th Strategic Operations Squadron (625 STOS). His responsibilities include integrating and coordinating the necessary command and control capability to provide support with the most accurate and timely information for the President of the United States, the Secretary of Defense, and to regional combatant commanders. On 7 May 2009, Chilton stated that the United States would not be constrained in its response to a cyber attack, therefore demonstrating the utility of his command which combines cyber defense with global strike. A previous commander, General James Cartwright (2004–07), explored ways to incorporate innovative collaborative tools into what has traditionally been considered a very centralized military organization. Speaking at a convention Cartwright said, "Where I would like to be is well outside the comfort zone of my organization. But what we've started with is just some simple 'blogging' tools, to try to change the culture a little bit; to try to allow people to contribute." ↑ "Air Force Times". Air Force Times. http://www.airforcetimes.com/story.php?f=1-292925-1995790.php. Retrieved 19 May 2011. ↑ "Cyber attack could bring U.S. military response". Securityfocus.com. 11 May 2009. http://www.securityfocus.com/brief/961/. Retrieved 19 May 2011. Air Force Magazine, Journal of the Air Force Assoc., August 2008.